It would be easy to assume that giants like Apple, Facebook and the carriers will control smartphone messaging. But the reality is that the global messaging market remains fragmented with several independent players like Sequoia-backed WhatsApp and Korea’s Kakao TALK. Japan, in fact, has a dominant smartphone messaging app of its own — and one with very enviable usage figures. A free calling and chat app developed by NHN Japan, Line has about 74 million users less than a year and a half after launch. About half of them are in Japan, which means that Line probably reaches about one-third of the country’s mobile phone users. Then about 86 percent of that 74 million-user figure is active on a monthly basis — which is very high. About 40 percent of registered users are active every day. Interestingly enough, it took off after last year’s earthquake. NHN released the app just two months after the devastating earthquake that triggered the meltdown at the Fukushima power plant. “People were not able to communicate with telephones or e-mail services from mobile carriers and we wanted as many people as possible to carry out a conversation,” said Jun Masuda, who is the chief strategy and marketing officer for NHN Japan. The company is a subsidiary of Korea’s NHN, which runs the country’s Naver portal and search engine. 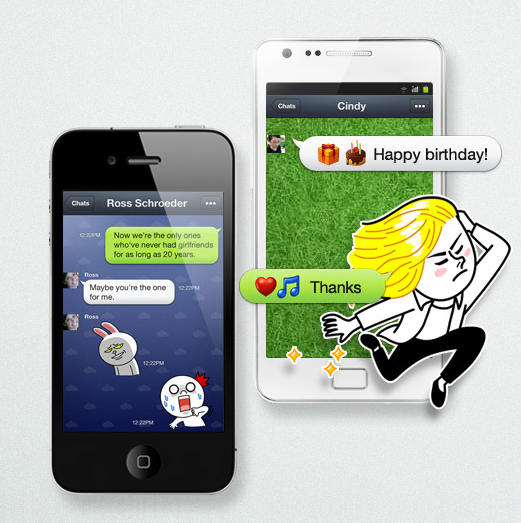 Line has the potential to be a very serious messaging player in Asia and globally — if it isn’t considered one already. Users can buy special emoji, called “stickers” that have everything from teddy bears juggling eggplants, to bunnies with flames of anger in their eyes, to a shy balding man surrounding by little sparkles and flowers. 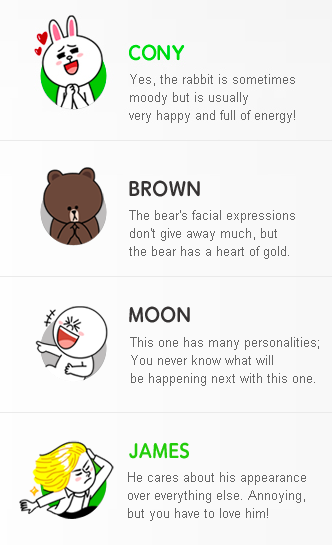 There are actually characters in the app (see left) like a moon person, a bear and a guy names James who is so handsome that he blinds himself when looking in the mirror. To bridge the language gap between users in different Asian countries, Line offers a translation engine that handles English, Chinese, Japanese and Korean if you invite a translator bot to your chat room. It also has profiles that look like Facebook’s Timeline with a big photo and tiny profile image up top. NHN hasn’t released really recent numbers on the app’s financial performance, but in July, it was pulling in about 300 million yen or $3.75 million per month in sticker sales. Since then, four months have passed so the numbers are higher now. The performance has been so strong that it’s helped revenues from web services in Japan more than double year-over-year for the company, if you see the excerpt from NHN’s last earnings report below. On top of sticker sales, there are a bunch of brand advertising revenue streams. Like Twitter, Line also has sponsored brand accounts where Coca-Cola can sign up for accounts that users can befriend or follow. They can also sponsor packs of stickers. Since Facebook just added emoji to its messaging app, this might not be a terrible idea to consider, at least in Asian markets. It grows virally, not through Facebook Connect or any other ID scheme, but through your phone number. Like the messaging app Beluga, which Facebook acquired, Line hashes the contacts in your address book, easing sign-ups for new users in the future. Like Facebook, Line emphasizes real identities. The plan is to make Line more of a global player, with marketing outside of Asia next year, and to use it as a platform for launching premium services like games, music and novels. Line’s current numbers and ambitions have prompted Japan’s biggest competitors to respond. DeNA, a $4.2 billion company best known for being one of the countries’ two biggest mobile gaming players, recently launched its own app Comm, which also offers free calls and chat.